92 Years Old Woman Test Drives Tesla Model X! "I'll Take It" - Muscle Cars Zone! People say that you learn throughout your whole life, and you are never too old to learn something new, hereby hence to many of us the Tesla new technology is one of the most advanced you could find in a car, we take a look at how a 92 years old woman handles it. Meet Roosi, the woman who had never previously driven an automatic transmission car and who has only been driving her beloved Moskvitsh. She has had that car for over 40 years and she simply loves it. But it was a time for a new challenge in her life, a new perspective and a chance to meet with Tesla model X, technology unlike anything else she has seen so far. It took some time for the driver to convince the 92 years old woman Roosi to do so, but eventually she said yes and they stopped at the nearest parking lot for a quick lesson. 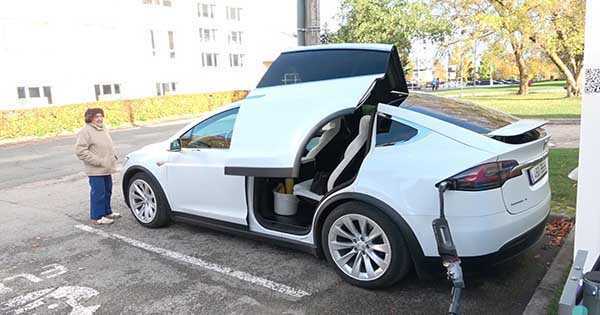 After explaining that there are just two pedals and no shifter, Roosi was ready to hit the road with the brand new Tesla Model X. Once she got the car going, funny enough, she said that it was just like the Moskvitsh and that is was pretty simple. She had even pushed the pedal a bit harder and felt what is like to drive an extremely powerful car. Roosi was absolutely impressed by the car and she even said that she would buy the car if she was 20 years old. What an amazing story! Finally, look at the damage made by this 94-year-old!